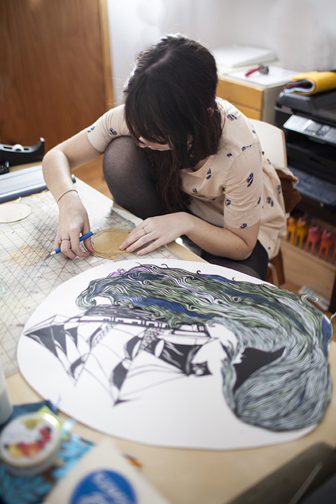 Katie Skau is currently an illustrator living in Brooklyn, NY who graduated from Pratt Institute in 2012. Katie's work combines cut paper with a collage of fabric and mixed media. She focuses on the beauty of nature in fairy tales and whimsical childhood dreams, telling classic poems and folk tales through the medium of paper. Each piece is individually hand-cut using an x-acto knife as well as other tools to create intricate details. Katie works as an illustrator, freelancer, designer, not limiting herself to any one type of project. She takes on a variety of work as well as welcoming individual requests for projects or artwork.